I bought some sparkly Red Heart Celebration yarn on clearance after Christmas. 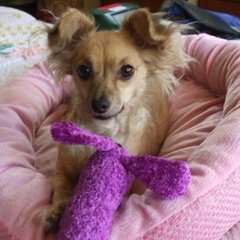 It's a bright colored yarn in jewel tones with a metallic silver thread that runs through it. The label had some Christmas ornaments that you could crochet with it. Anyway, the yarns colors reminded me of jesters and Mardi Gras. So I decided to make another poncho in tunisian crochet using a size J hook with a flexible extension cord. Here's the poncho I came up with. 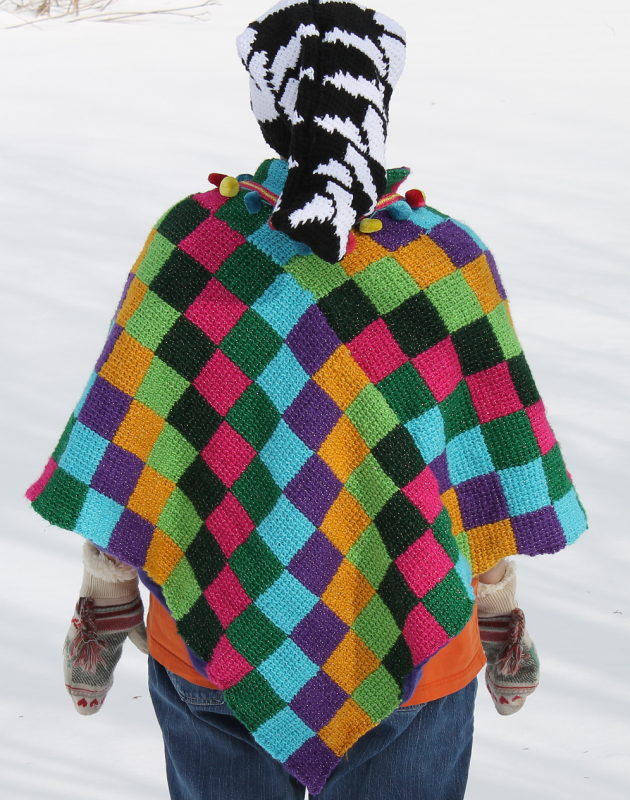 It's made by crocheting two rectangular panels, (7 squares by 17 squares each), and then attaching the panel together by joining the end of one panel to the side of the other both on the front and back of the poncho. You can see the seems running diagonally across each side. (Since tunisian crochet stitches are taller than they are wide, each square is 10 stitches wide by only 8 stitches tall). 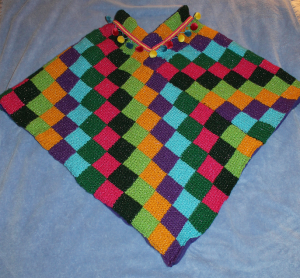 Once the panels are attached, you still need to make two more rows of squares to fill up the poncho to the neck. 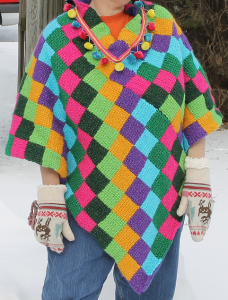 I then added a small pompom fringe that was just large enough to go around once. It's sewn over one of the looser seams created by having to add the extra two rows to the top. (Isn't there some unwritten law that a crocheted poncho requires a bit of pompoms or fringe anyways?) LOL!!! Just kidding. I think it looks really cute too. Here's the front flat. It flares out nicely at the neck which is great because the metallic thread in the yarn is scratchy. That's why I lined it with a dark purple fleece blanket material. It's very warm and soft. I was going to add pink jingle bells to make it even more "jester - like", but my son said not too. (Something about not wanting to annoy people whilst wearing it). LOL!! There's lots more photos in my blog of the lining and such. 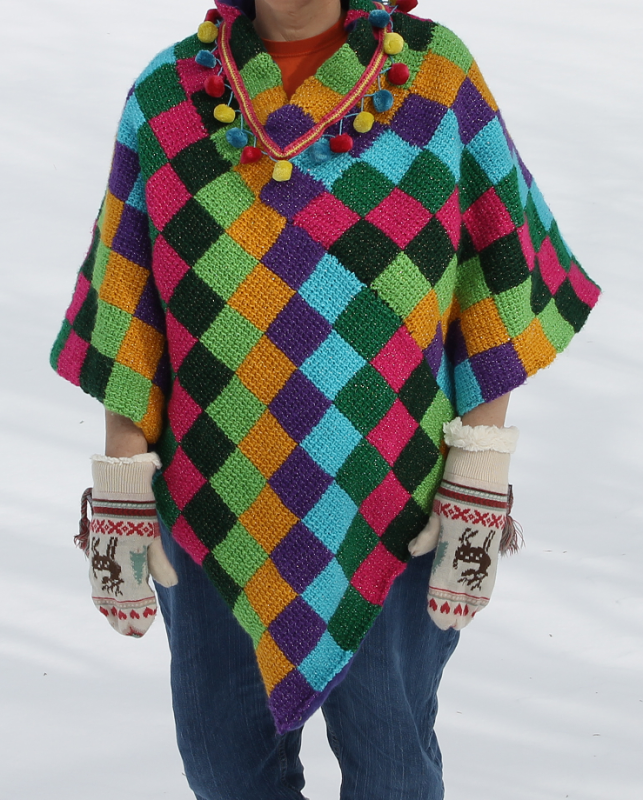 I hope the photos show the sparkly - ness of this poncho. It was really fun to make. Very sophisticated look! I love it.